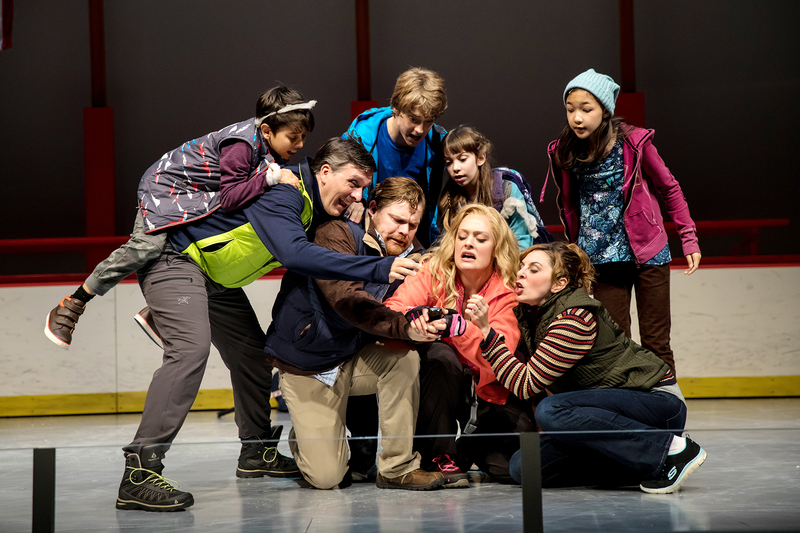 A reporter (Stephanie Bertumen) catches a Yeti (Ryan Colbert) on the ice in The Abominables, now playing at the Children’s Theatre Company in Minneapolis. Photo by Dan Norman. The Abominables, a new musical playing at the Children’s Theatre Company, is an entertaining story about acceptance, team work, and the belief that one is happier being nice rather than mean. Michael Friedman, who passed away just days before the musical open, wrote the show’s catchy music and lyrics. Playwright Steve Cosson also serves as the director of this world premiere musical about hockey in Minnesota. Having both attended a hockey high school and being a “softball mom,” I could well relate to the all-encompassing nature of sports on students, players and families. To create this musical, Cosson and Friedman immersed themselves with hockey culture by interviewing players, the players’ family members, and their coaches. They have succeeded in capturing and recreating the all-absorbing nature of the role of sports can have on both children and families. The musical centers on two main characters. The first is Mitch (Henry Constable), a B Team hockey player who spent his entire summer practicing hockey so he could move up to the A Team with his other B Team buddies. The second is Harry (Ryan Colbert), an abominable snowman who is referred to as a Yeti. To make a long story short, Harry’s adoptive, mountain-climbing family moves to Minnesota so he can play hockey. At the tryouts for the A Team, Harry is a standout who places on the A Team with Mitch’s old B Team buddies, while Mitch is left on the new B Team. As a result of Mitch’s failure to make the A Team, he goes from a really nice kid to one being self-centered and obsessed with finding a way to get Harry off the team so he can get on. Hockey parents Charlie (Bradley Greenwald) and Ellen (Elise Benson) look glumly on at a game. Photo by Dan Norman. Not only is Mitch stuck on the B Team, but Ellen’s social life has been affected since she can no longer hang out with the mothers of those boys who made the A Team. Ellen and Charlie also have two daughters who often do not get their attention: a middle daughter, Tracy (Nancy Tran), who is a contented to be a perennial on the girls’ B Team for hockey, and Lily (Valerie Wick), a much younger daughter who steals the show from the very beginning with her song about being the princess of everything except hockey. A multi-family tussle while trying to read the tryout results. Photo by Dan Norman. Harry’s adoptive parents, Judy (Elise Benson) and Frank (Bradley Greenwald), are human and are professional mountain climbers. They are also always the best at what they do and expect Harry to be the same. They found Harry when he was very young and alone on a mountain in a blizzard. Their much younger human son Freddy (Alejandro Vega) is, like Lily, often ignored and a scene stealer. The talented cast gives the show great energy and have fun with the songs. Ness, Sigmund, Benson, and Greenwald are all in fine form as the parents who provide much of the humor in the show. Ness’ portrayal of Ellen reacting to this sudden change in her hockey mom social status is very relatable to any parent who has a child who stops participating in team sports. Constable’s Mitch plays a believable middle-schooler, but his singing is not quite up to the same level as his acting talents. Colbert, as Harry, gives a strong performance as a wide-eyed innocent who is hurt and confused when Mitch’s intentionally inflicts emotional damage on him. 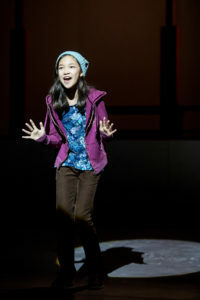 Tracy (Natalie Tran) excels at hockey – not that her on-stage parents have noticed. Photo by Dan Norman. The younger actors provide some of the most endearing roles in the show. Tran, as the middle sister, does a wonderful job playing the well-adjusted sibling who enjoys hockey but doesn’t make it an obsession like her brother. Wick as Lily and Vega as Zach are the most captivating characters, especially when they join together to form their own anti-hockey club. The first two-thirds of the musical is great. One of the most memorable musical numbers is the “Minnesota Nice” song performed by Ness. The last third of the show needs work. Mitch gets so mean at the end that he is almost unredeemable. As an adoptive parent, I found myself cringing at Mitch’s remarks to Harry about his birth family (this apparently has been revised and softened this past week – something that perhaps might have happened earlier if not for Friedman’s untimely passing). The introduction of Harry’s birth family comes across awkwardly and the solution to the twisted family dynamics is abrupt and simply not realistic. Despite the show’s flaws, The Abominables is a delightful musical for adults and children’s alike. I did not bring my grandchildren to the opening because the website stated that the show was recommended for ages 8 and up. However, in my professional opinion this musical is appropriate for children as young as 5 years, and I plan to return with my grandchildren. The Abominables plays through October 15 at the Children’s Theatre Company in Minneapolis, MN.